Immunoprecipitation of tri-methyl-histone H3 (Lys27) from HeLa cell extracts using Tri-Methyl-Histone H3 (Lys27) (C36B11) Rabbit mAb (Sepharose® Bead Conjugate) and Rabbit (DA1E) mAb IgG XP® Isotype Control (Sepharose® Bead Conjugate) #3423. The western blot was probed using Tri-Methyl-Histone H3 (Lys27) (C36B11) Rabbit mAb #9733 and Mouse Anti-rabbit IgG (Conformation Specific) (L27A9) mAb (HRP Conjugate) #5127 as a secondary antibody. 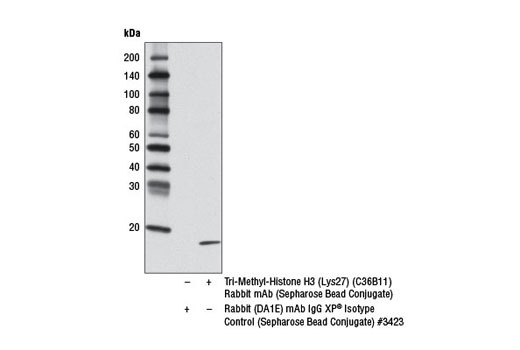 Tri-Methyl-Histone H3 (Lys27) (C36B11) Rabbit mAb (Sepharose® Bead Conjugate) recognizes endogenous levels of histone H3 only when tri-methylated on Lys27. The antibody does not cross-react with non-methylated, mono-methylated, or di-methylated Lys27. In addition, the antibody does not cross-react with mono-methylated, di-methylated, or tri-methylated histone H3 at Lys4, Lys9, Lys36, or Histone H4 at Lys20. This Cell Signaling Technology antibody is immobilized via covalent binding of primary amino groups to N-hydroxysuccinimide (NHS)-activated Sepharose® beads. Tri-Methyl-Histone H3 (Lys27) (C36B11) Rabbit mAb (Sepharose® Bead Conjugate) is useful for the immunoprecipitation of tri-methyl-histone H3 (Lys27). The antibody is expected to exhibit the same species cross-reactivity as the unconjugated Tri-Methyl-Histone H3 (Lys27) (C36B11) Rabbit mAb #9733.